One could be forgiven for thinking that this is taking place in a battlefield. Well it is for these horses who are racing for their lives for human entertainment and $2 bets. 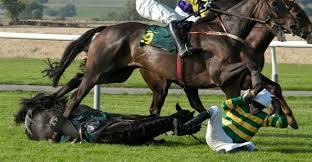 Horse racing is not a sport. It’s a cruelty circus full of abuse, pain, and suffering. It’s also a death camp. Anybody who has the audacity to come on this blog and defend this blatant animal cruelty, either by participating and/or supporting it, needs their head checked for deliberate delusional psychosis. Can’t agree with you more, Gina. How can we stop this. Petitions and protesting works. Thank you Patrick. Because of you, this cannot be swept under the rug. Yes. I second that – thank you Patrick. Absolutely!…THANK YOU Patrick! And THANK YOU to all who have chosen to support the HORSES of this industry and NOT the industry itself! Absolutely much thanks to Patrick for bringing this to the attention of the public. I have to admit I was not aware of the extent of the abuse!